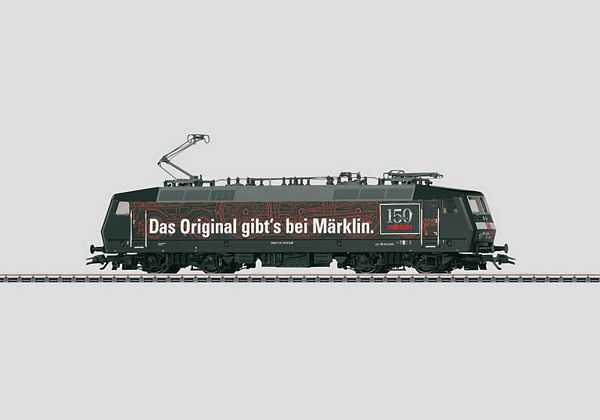 Prototype: German Railroad, Inc. (DB AG) class 120.1 fast, general-purpose locomotive in the special advertising paint scheme for the anniversary "150 Years of Märklin". Model: The locomotive has an mfx digital decoder, controlled high-efficiency propulsion, sound, and light functions. 2 axles powered. Traction tires. The headlights are warm white LEDs. The headlights will work in conventional operation and can be controlled digitally. The locomotive has engineer's cabs with interior details. It also has separately applied grab irons. Length over the buffers 22.1 cm / 8-11/16. Advertising locomotive for Marklin's great anniversary. Digital sound: locomotive whistle and station announcements. The 37530 electric locomotive will be produced in 2009 in a one-time series only for Insider members.